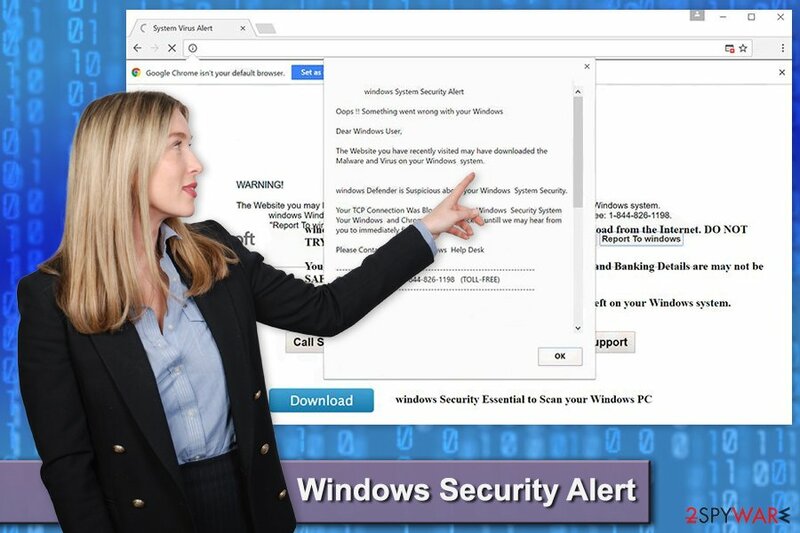 “Windows Security Alert” pop-up is the PUP that uses misleading techniques to prevent removal. Use Reimage to locate malicious components and get rid of them faster than with uninstall instructions. A full system scan blocks virus reappearance and prevents traffic to malicious domains. “Windows Security Alert” is a fake message that might pop up during your regular browsing sessions. This alert is delivered by a malicious website that you might be forced to visit by an adware program or high-risk website. The notification informs that something went wrong with Windows operating system because one of the recently visited sites may have installed malware on the computer. For this reason, user’s device has been blocked until he or she calls Windows Help Desk via 1-844-826-1198. Nevertheless, authors of the “Windows Security Alert” virus claim that it’s a toll-free number, you should not dial it. This security alert is fake. We can assure that any serious virus is not installed to your computer yet. What is more, this customer support service won’t help you to fix any problems. Most likely fake specialists will convince you to download fake software or install remote access tools. Scammers may have created this cyber infection for numerous reasons. However, none of them is related to doing something good for the computer users. Once you end up on Windows-security-alert.info, you should close browser’s tab immediately. Do not click any buttons because it may lead to the installation of malware. Leaving this website is just a temporary solution. You will be redirected to this site again soon. In order to stop undesired redirects, you need to run a full system scan with anti-malware program. Reimage can help you to remove “Windows Security Alert” within several minutes. Usually, the virus is related to an adware program. Thus, this apart from showing this fake security alert you might also notice increased amount of intrusive ads. What is more, adware might track information about users and even share it with third parties. If you delay “Windows Security Alert” removal, you might also notice unknown browser extensions installed to Chrome, Firefox, and other web browsers. Keep in mind that various data tracking technologies might be installed as well. The biggest problem is that these tools might be interested in tracking sensitive details. Thus, it may lead to serious problems and privacy-related issues. “Windows Security Alert” tech support scam aims to trick users that their computers were infected with malware. “Windows Security Alert” fake message is usually triggered by an ad-supported program, or adware. This potentially unwanted application may have sneaked inside the system unnoticed during the installation of freeware. Developers of such applications use bundling technique to infiltrate computers silently. As we have mentioned in the beginning, you might also end up on this technical support scam website after a visit to the high-risk site. For instance, adult-themed or gaming sites might be designed to redirect users once they click “Play” button or blank space of the site. Thus, you should stay away from potentially dangerous websites. “Windows Security Alert” might reach computer users all over the world. It doesn’t matter where you live – in Spain, Iceland or Algeria – if you do not take previously mentioned precautions, you might suffer from scammers. We highly recommend choosing automatic “Windows Security Alert” removal option. By scanning the system with a reputable anti-malware program, you can get rid of this threat easily. An updated security program will locate and delete all virus-related components for you. However, you can try to terminate it manually as well. Redirects to this malicious site are usually triggered by adware. Thus, you need to find and remove it from the system. Below you will find detailed guidelines how to remove “Windows Security Alert” manually. Please follow them carefully. Manual elimination might be complicated because the virus may have installed additional components and helper objects. Thus if redirects and pop-ups continue showing up, you should opt for the automatic removal. 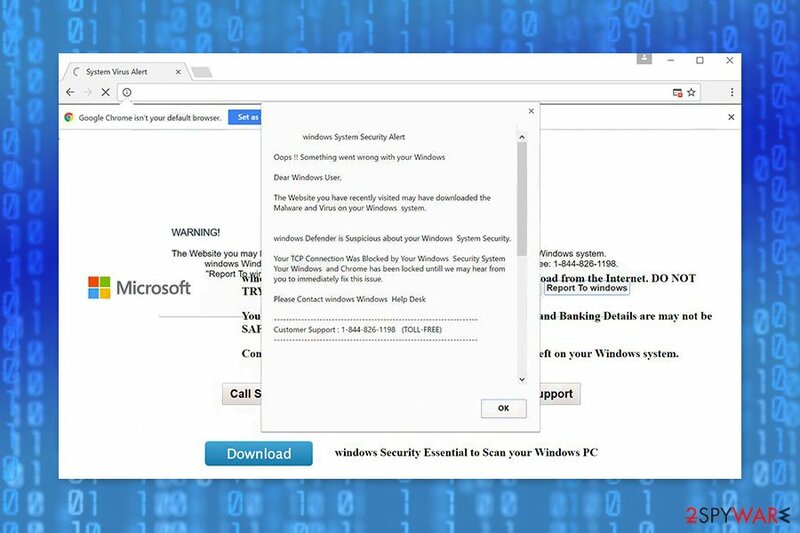 Follow the steps below to locate and remove adware that is responsible for Windows Security Alert pop-ups. Here, look for “Windows Security Alert” pop-up or any other recently installed suspicious programs. Wait until you see Applications folder and look for “Windows Security Alert” pop-up or any other suspicious programs on it. Now right click on every of such entries and select Move to Trash. In order to get rid of the virus entirely, follow the steps below and reset Internet Explorer. When in the new window, check Delete personal settings and select Reset again to complete “Windows Security Alert” pop-up removal. Once these steps are finished, “Windows Security Alert” pop-up should be removed from your Microsoft Edge browser. Uninstall suspicious extensions from Mozilla Firefox in order to terminate “Windows Security Alert” pop-up virus entirely. Here, select “Windows Security Alert” pop-up and other questionable plugins. Click Remove to delete these entries. Now you will see Reset Firefox to its default state message with Reset Firefox button. Click this button for several times and complete “Windows Security Alert” pop-up removal. Open the list of Chrome extensions and delete suspicious entries that might be responsible for bringing “Windows Security Alert” message. Then reset the browser in order to get rid of tracking cookies. Here, select “Windows Security Alert” pop-up and other malicious plugins and select trash icon to delete these entries. Click Reset to confirm this action and complete “Windows Security Alert” pop-up removal. Here, select Extensions and look for “Windows Security Alert” pop-up or other suspicious entries. Click on the Uninstall button to get rid each of them. Now you will see a detailed dialog window filled with reset options. All of those options are usually checked, but you can specify which of them you want to reset. Click the Reset button to complete “Windows Security Alert” pop-up removal process. ^ Margaret Rouse. Adware. TechTarget. The global network of technology-related websites. ^ The Murky World of Third Party Web Tracking. MIT Technology Review. The website about technology. ^ Losvirus. LosVirus. Spanish website about computer viruses and their removal. This entry was posted on 2017-07-05 at 06:19 and is filed under Malware, Viruses. You can quickly scan the QR code with your mobile device and have “Windows Security Alert” pop-up virus manual removal instructions right in your pocket. How did you remove “Windows Security Alert” pop-up virus?